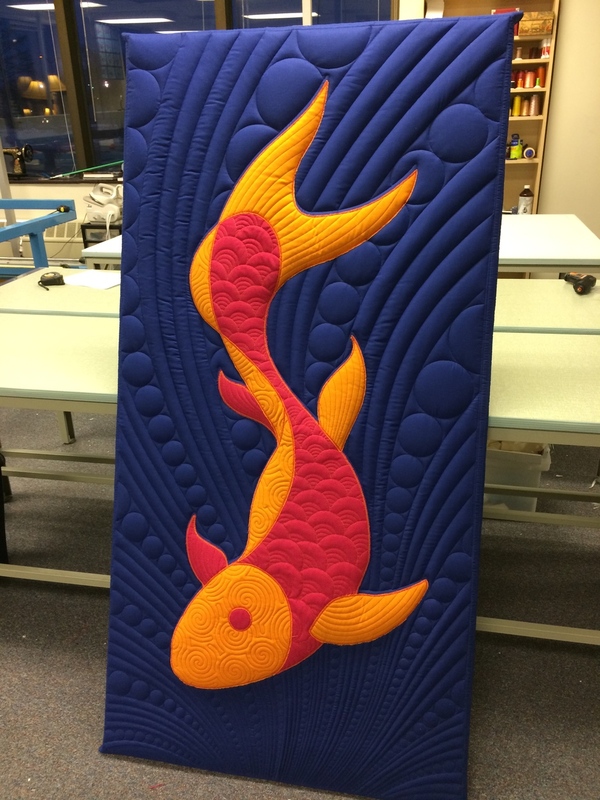 The "quilts" on this page are examples of a technique we call "double quilting", which is very difficult to achieve any other way than with a full-frame robotic quilting system. Each piece consists of five layers in total: three layers of fabric interspersed with two layers of batting (like a Big Mac). The upper layer of batting is relatively thin and gives the fine relief you see, for example, in the face and in the fish scales. The lower level of batting is very think (over two inches before stitching) and gives the large-scale relief, for example of the head as a whole, and the hair, arms, body, and flaming circle. This is more fabric art than it is quilting. Every piece is custom made and shipped optionally with a mounting frame. Sizes up to nearly 8 feet square are possible, or just over 7 feet square if mounted.